As a Service or On-Premises? You can choose the deployment option that’s right for your business. 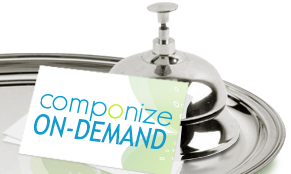 Have Componize hosted for you and available 24/7 (Componize SaaS), or implement it on your business premises. Is Componize SaaS for me ? to get up and running immediately. the vendor to take care of hosting your DITA solution. a flexible pricing model, with the ability to add or reduce the number of users. the freedom of a cloud solution with the benefits of a secure, dedicated storage. Is Componize on-premises for me? You want to keep control of your data on your own site. Your IT team installs and maintains your content management solution. You prefer integrating and customizing the solutions in-house. You can also choose an on-site installation. In this case, your IT team installs and maintains your content management solution and data, otherwise one of our system integration partners takes care of the installation, customization, and maintenance.